The Cloistered Heart: is there room? Sometimes, at this time of year, a question drifts into my mind. It's always the same. "Is there room in Your heart for Me?" I immediately think of innkeepers. I think of a house in Bethlehem where travelers once lodged, where no room was found when the time came for Jesus to be born. As a cloistered heart, I have said that my primary "apostolate" is that of making my heart a refuge for Jesus in the midst of a world which does not, on the whole, love and honor Him. Christ is in my heart; this I know. But sometimes I wonder. What sort of "refuge" am I offering to Him? Am I providing a place of welcome and adoration? Or could it be that I've allowed my heart to become cluttered with so many other things that I have little room in my life for Christ Himself. The inn in Bethlehem was not filled with "bad" people on the night Mary and Joseph arrived seeking shelter. It had no room for the holy family only because others had gotten there first. Does Jesus find little space in some of my days simply because the hours fill up with everything else first? Do I get up in the morning and put off prayer until I get one thing accomplished, and then one more thing - and do I ever find that the day has sped by without my spending any time at all in communication with God? I am deeply ashamed to admit that more often than I care to mention, this has been the case. My heart appears to me, today, somewhat like a cluttered desktop. Or perhaps like a cluttered manger, in which there is no room for even a tiny Babe. I am ashamed of the clutter in my heart. I'm much more ashamed of this than of the clutter that accumulates, piece by piece, upon my desktop. And so I come today to Jesus, asking HIM to clear out all the distractions and (especially) the sin. I ask our Blessed Mother, who so tenderly prepared a place for Jesus, to help prepare my heart to be a fitting refuge for my Lord. 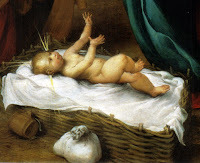 May she re-arrange my priorities as one might arrange pieces of straw in a manger. As my Christmas gift this year, I ask that the same be done for you. I ask that all our hearts be prepared as places of loving refuge for the King and Messiah Whose birth we are about to celebrate. The world did not welcome Him when He came to earth as an infant; the world does not welcome Him still. You and I have the opportunity of welcoming Him in a world which does not do so. You and I have the opportunity (and I think we would fall on our faces if we could see the full reality of it) to lovingly embrace Him. Let our hearts prepare Him room.